I fell like I have waited long enough to participate in this debate. Actually, the fact that this is even a debate boggles my mind. The fact that this is referred to as a “deal” is shocking in itself. Since I am a history teacher I view moments like these through a unique lens. I would propose that when a nation comes to a crossroads such as this, we cannot afford to view it in any other way. I would greatly encourage our President, and his advisors, to take a refresher course on the history of appeasement. Appeasement is the process of giving concessions to someone else, generally with the hope of avoiding conflict. Ah yes…appeasing tyrants…that always secures safety in the world. Sarcasm aside here is a hypothetical conversation. Check out the video first. Person 1: What about World War II? Appeasement certainly didn’t work between the British and Hitler! They gave him the Rhineland, Austria, the Sudetenland, and allowed him to defy every aspect of the Treaty of Versailles, in hopes he wouldn’t go any further. Just ask Poland how that worked out. So why then does our government think it’ll work now with Iran? Person 2: Well that was different. You can’t compare Iran with Nazi Germany. I mean, Hitler wanted to dominate the world and wipe out entire groups of people. No government in the world today is that evil. Person 1: Timeout! Iran has vowed on multiple occasions to eliminate Israel and all it’s people from the face of the earth. Person 2: Those threats came mainly from the previous regime in Iran. This one is far more peaceful. Person 1: Then why is Iran still on top of the list of nations that support international terrorism according to the US Department of State? Person 2: Well this agreement limits Iran’s capabilities to develop nuclear weapons and doesn’t aid them in funding terrorists. 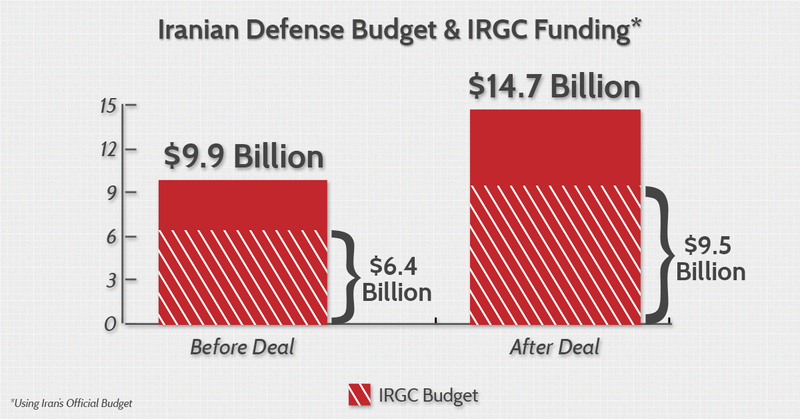 Person 1: Actually this “deal” gives Iran a lot of money and does not prevent them from developing nuclear weapons. In fact, they will get to investigate and monitor their own nuclear facilities to keep themselves accountable. Iran spends 65 percent of its defense budget on the IRGC, its elite paramilitary force that actively supports terrorist organizations throughout the Middle East. On top of all of that, Iran will receive and estimated $120 Billion in frozen assets immediately. I could continue this conversation but I’m sure you get the picture. The point is this debate is more about a president “sticking to his guns” on a deal he didn’t even create and trying to rally enough democratic Senators to support “his deal”. 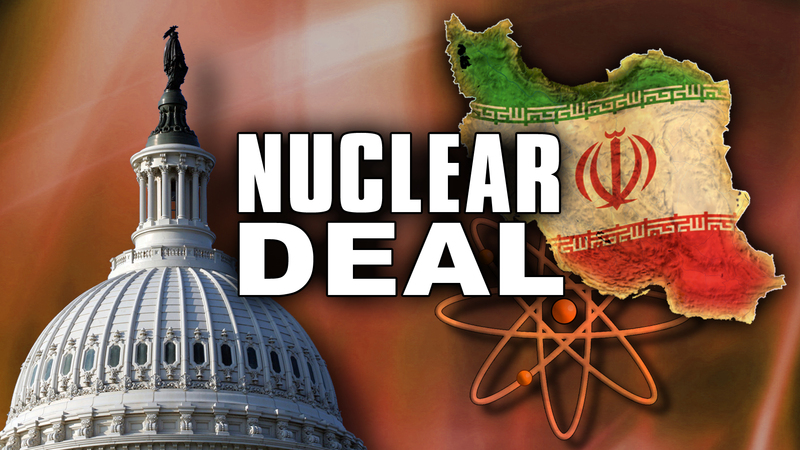 The majority of our US Congress is against this deal. The only thing in doubt is whether they will be able to have a 2/3 vote to overturn Obama’s veto if that time comes. Recent polls show more Americans are against the deal than support it. Over 60% of Americans don’t trust Iran to uphold any agreement. Thirty percent more Americans believe Iran is getting the better end of the deal. Our government is supposed to be responsive to the people. If the only branch directly elected by the people (Congress) and the majority of the citizens of this country are against this deal, then why would our president not be against it also? I doubt he believes heart and soul that this deal is the best thing. I believe this is far more of an ego battle and a petty political party standoff. Darn those party politics. I’m sorry. I really didn’t intend to get political. It just kind of happened. Check out the video below. According to the polls previously mentioned 41% of those asked didn’t feel informed enough to have an opinion on this topic. That is a tragic stat. Perhaps tragic is a strong word but it is extremely disappointing. An uniformed public leads to an apathetic public which gives way to an inactive public. This is not an issue that we as citizens of this nation, and the world for that matter, cannot afford to be silent on. If we are truly a nation for the people as Lincoln once said, (“…we here highly resolve — that this nation, under God, shall have a new birth of freedom — and that government of the people, by the people, for the people, shall not perish from the earth”) then our people need to be heard. If you want your voice to be heard click on the links below. They are easy and practical ways to have a voice and possibly sway the outcome. Neither will take much time at all. Also, spread the word. Tell your friends and family. Use social media to raise awareness. This deal is dangerous, not just for Israel, but for everyone who is affected by international terrorism. In other words, the world is in greater danger by this deal. 5 Characteristics Of A Lasting Legacy. In this day and age it is easy to criticize professional sports for the amount of money paid out to athletes. Of the four big professional team sports (football, baseball, basketball, and hockey) Major League Baseball does not have a set salary cap for each team. This makes it possible for teams like the Dodgers and Yankees to spend over $200 million on player’s payroll. The San Diego Padres rank towards the bottom of the league teams (22nd) in terms of the payroll amount with $100,675,896. Still a hefty amount, no? The Padres, however, are somewhat unique. If you look at their payroll you’ll find the name of a player who has never played in a major league game for them. 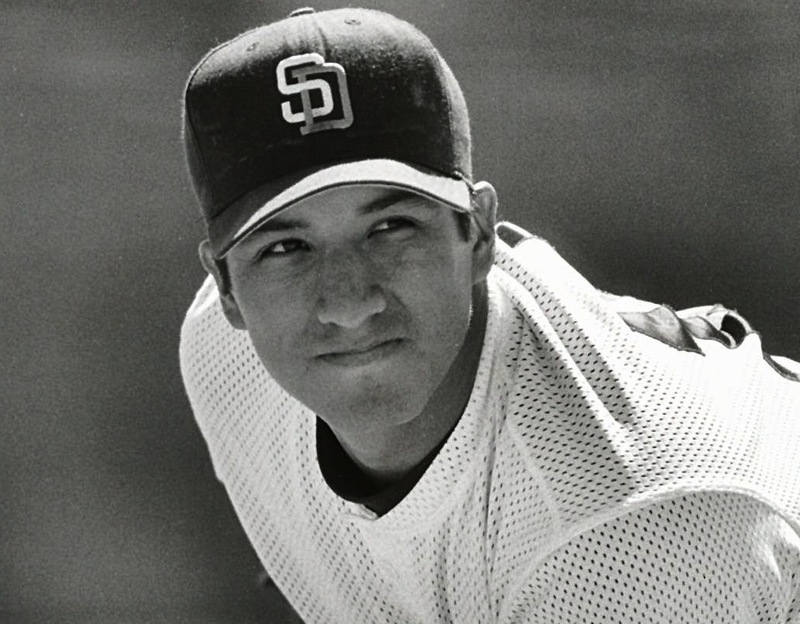 Matt LaChappa was drafted by the Padres as a pitcher 20 years ago yet he hasn’t played since 1996. If you’re a Padres fan the name is probably very familiar. But not because he hit game winning homeruns, or pitched no-hitters. It’s because he has inspired many, and so has the the Padres organization has shown him. While warming up as a relief pitcher in a minor league game, LaChappa, a bright 20 year old prospect, suffered a massive heart attack. This heart attack left him with debilitating brain damage and confining him to a wheelchair ever since. So why is he still being paid? The Padres director of minor league operations, Priscilla Oppendheimer was quoted saying, “Matt LaChappa is a Padre for life,” She was the one who proposed that the team could just go on paying LaChappa, renewing his basic minor-league contract. Matt LaChappa has been covered financially since the day of the unfortunate accident because the San Diego Padres have kept up his contract and covered him with medical benefits. This story is one of those that causes some serious self-reflection. Deuteronomy 16:17 says, “Every man shall give as he is able, according to the blessing of the LORD your God which He has given you.” Out of their abundance, the Padres have been giving generously. It’s not a publicity stunt or promotion to raise fans. It’s genuine. I am definitely not as well off as multi-million dollar baseball organizations, but I have been blessed by the Lord far more than I deserve. We all have in fact. Love and compassion is at the very heart of the Gospel. Stories like this show that we should all give to those who can never repay us because it’s right and it’s good and it’s part of what God has created us to do (Luke 14:13-14). Let’s face it…it’s the least we can do in light of what we have received. Because no one has given more generously than God Himself. Contained within the first amendment of the U.S. Constitution are invaluable freedoms such as speech, petition, and to peaceably assemble. Most nations throughout world history have never allotted such opportunities to its citizens. In fact, more people in the world today live without those freedoms than those that do, and most that do, live with limited versions. They are rights that have long been fought for in this country and have not always been honored by our government. However, in today’s America those freedoms are widely exercised and upheld and citizens of this nation should use these treasured rights to push for change and justice. Over the course of the past year, many have gone too far, committing acts that are merely criminal at best. Showcase: Ferguson. On the one year anniversary of the shooting of Michael Brown the criminal acts reemerged. Authorities had to declare a state of emergency in Ferguson, Missouri, on Monday in an effort to put down repeated violence that erupted during demonstrations overnight. Not all broke the law in an attempt to right a perceived wrong. Clergy and civil rights groups led a rally of more than 100 people through city streets, shouting, “This is what democracy looks like” and “Black lives matter.” What began as peaceful demonstrations on Sunday night descended into chaos as gunshots rang out when police in riot gear tried to disperse protesters blocking traffic and smashing storefront windows along a street. Police said Sunday’s gunfire began with two groups of agitators apparently shooting at each other before one of the gunmen ran across a parking lot and was stopped by four officers in an unmarked vehicle. Reports say the gunman, Tyrone Harris, then opened fire on the police and in turn was shot by the police. There’s one word that comes to mind when looking at this situation…hypocrisy. I’m obviously not talking about those who choose to exercise their God-given and constitutionally-protected rights, but people who protest police violence with crime are no better than those whom they are protesting. 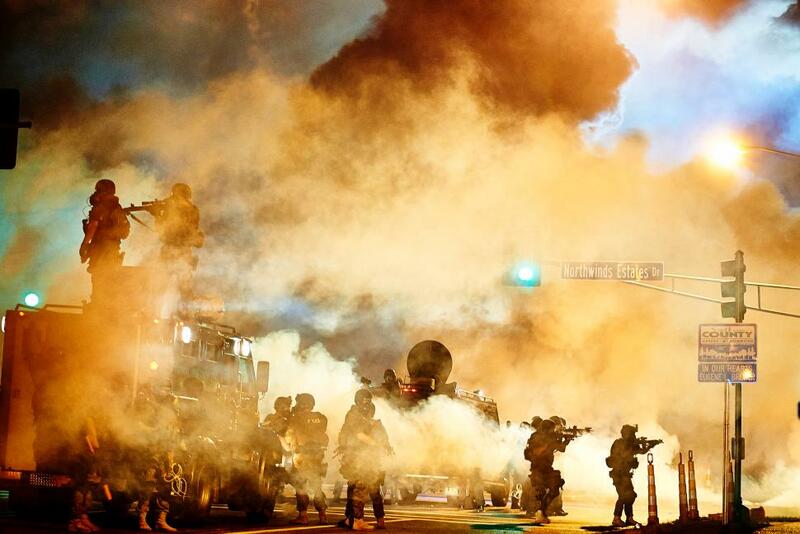 This is only a capstone to the first two waves of rioting back in August 2014 following the death of Michael Brown and November and December of 2014 after the jury’s decision to not punish the officer who shot Brown. What was the result of all those riots? Six officers injured, ten people from the public injured, 211 arrests, and millions of dollars in damage done. This is always the end result, if not worse, when people fight hate with hate…it only serves to perpetuate the problem. People who protest in such a manner spit upon the constitution. Their ruthless, unjust acts are a slap in the face to all those who have gone before them like Martin Luther King Jr., Rosa Parks, Medgar Evers, and many more. They think they are standing up for justice when really they are as much the problem if not a bigger part of the problem. This hate rings out all too familiar heralding us back to days of the militant Black Panthers and propaganda of radicalism and violence promoted by people such as Malcolm X. Let’s learn from history. What happened to Malcolm X? He was killed by the people he formerly led. What service did the militant groups serve? They set back progress that the non-violent activists were achieving and painted their cause in a very bad light. I hail those who have stood up for justice in a peaceful way and have chosen the path of giving underserved love and respect to people regardless of how they are treated. I hail those who have shown the value of the rights expressed in the first amendment. I hail those who refuse to suffer injustice as long as injustice is sufferable (Declaration of Independence). Those people inspire change. Those people call others to come and follow in their footsteps. As Jesus Christ once said, “those who draw the sword shall die by it.” (Matthew 26:52) Martin Luther King Jr. later used that as a motto to his nonviolent movement and it served to stay the hand of many. I have no doubt that police brutality causes anger to well up inside many. Rightfully so. I am not ignorant to the fact that race can be an issue in parts of this nation. But in the words of our Maker, “do not repay evil with evil.” (Proverbs 20:22, Romans 12:17, 1 Peter 3:9 and many more). If we want to see the world change we need to, “love your enemies and pray for those who persecute you.” (Matthew 5:44) When the world sees the power of grace working through those who stand up for injustice, hearts will be changed! Ultimately, we know that it is God who will bring the final, enduring justice and may Christ return soon to hasten that day! The above picture may seem like it is from a different and more barbarous age; from a time when evil covered Europe under the umbrella of the Nazi regime. Why would one guess that? Because how could such cruelty and hate still exist in today’s world? One thing I’ve observed being a history teacher is that people forget. The main ingredient in the recipe for repeated disaster is for future generations to lose touch. You may have heard the motto ‘those who fail to learn from the past are destined to repeat it.’ It’s not necessarily a matter of knowing facts about past events but the idea of learning is that it becomes real to us. We need to get it. We need to understand why it happened and the tragic effects it had on people’s lives, maybe even our own. We need to get it to the point where we don’t ever want it to happen again. As the sting of the 1930s and 1940s wears off with each new generation, room is given for expressions of antisemitism to reemerge on an increasing scale. Each new year in the 21st century is outdoing the previous one. How about in the United States? You bet. 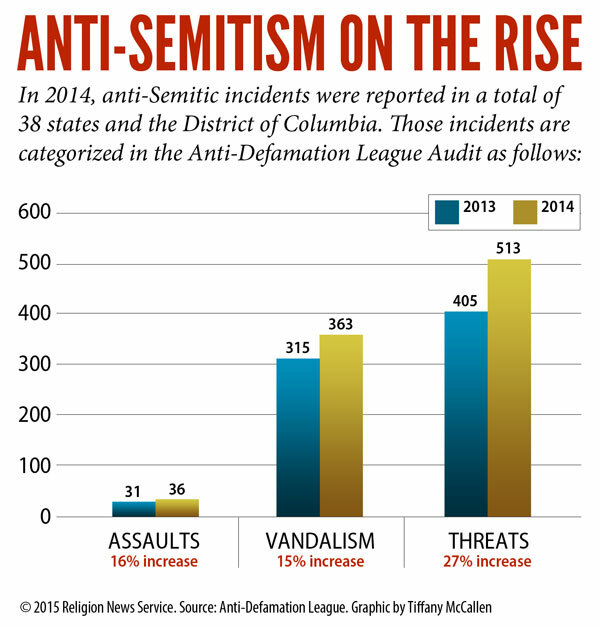 There was a 21% increase of reported acts of hate towards Jews in 2014 compared to 2013. There were 912 recorded incidents including 513 harassments, 363 acts of vandalism, and 36 physical assaults across 38 states in the U.S. The worst states are New York, California, New Jersey, Florida, and Pennsylvania. This year, 2015, hasn’t been off to any better of a start. There were marches held protesting Israel in places like Milwaukee and rallies held outside of synagogues. Jewish communities and synagogues have been attacked through cyber hacking. 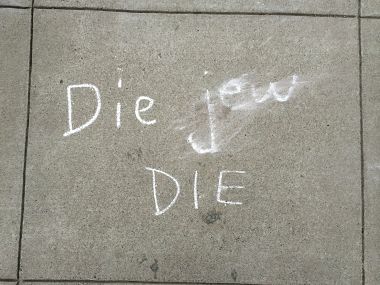 Hate messages have been spray painted on Jewish shops and synagogues with messages like ‘Hitler was right’ and ‘Jews=killers’ as well as swastikas. Then there was the shooting in Overland Park, Kansas in the Jewish community. I’ll bet a lot of people don’t even remember that. Ever heard of Louis Farrakhan? He’s a minister of the Nation of Islam and he’s probably done more to rally people against Jews than anyone since Adolph Hitler. Some of his messages at organized million man marches are chillingly similar to those heard in Germany in the 1930s. Farrakhan has even spoken out in support of Hitler on occasion. He’s most recently been taking his anti-Semitic message to the music industry, rallying support of young and experienced rappers. 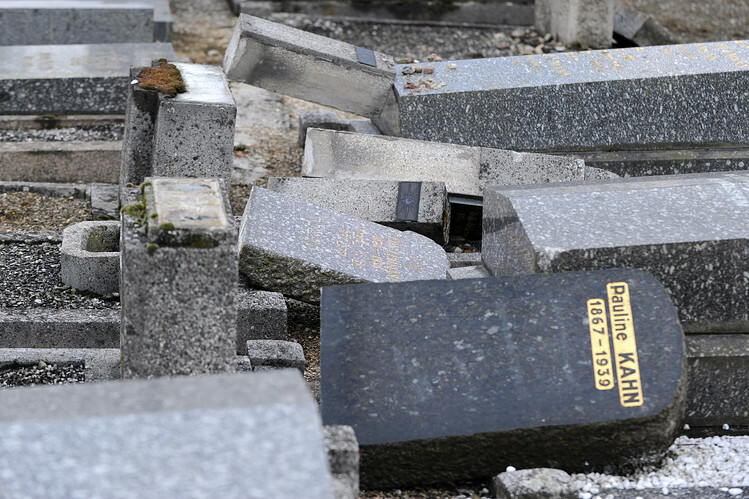 -In Argentina messages like ‘death to Jews’ and swastikas have been plastered on Jewish community centers and a Jewish cemetery was vandalized. -In Austria a man wearing a Star of David necklace was beaten as well as two other Jewish boys. -In Copenhagen, Denmark a synagogue was shot up and shops were vandalized. -France has seen probably the most violence towards Jews in Europe. 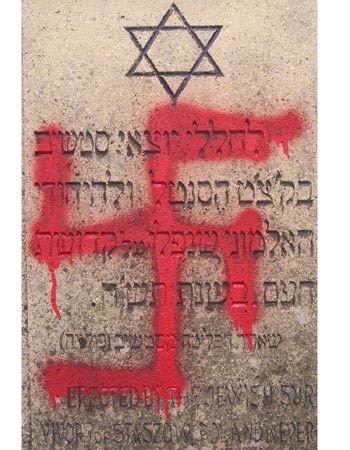 There , a Jewish woman and her child were beaten while the thugs yelled, “Hitler didn’t finish the job.” Two 16 year old Jewish boys were beaten and 250 graves were overturned and swastikas painted on gravestones. Let’s not forget the attacks in Paris where a Jewish shop was shot up. -In Brussels a Jewish museum was attacked. -In Brazil posters were hung up in the capital city calling Jews killers, thugs, and criminals. -How about our northern neighbors? In Montreal, Canada cars were painted with swastikas. -More incidents have occurred in the nations of Germany, Holland, Hungary, Italy, Poland, Russia, South Africa, Ukraine, United Kingdom, and Venezuela. To learn more check out adl.org. When most think of people who hate Jews they think of the Arab nations that surround them, like Iran and Egypt. 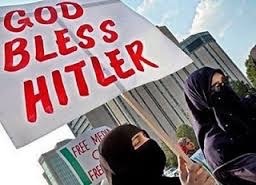 And while some figures have shown that upwards of 3/4 of the populations in those nations harbor antisemitic feelings, and while Iran has expressed its desire to wipe Israel and all Jewish people off the map, antisemitism is very much a serious problem around the world, and a growing one here. The European Union’s Fundamental Rights Agency released a study showing that 64% of European Jews don’t report incidents. I seriously doubt that number varies much in others places in the world. So that tells us that the problem is much worse than statistics show. Consider the thousands of antisemitic people who don’t act on their twisted view. All the world needs is for good people to sit back and ignore the problem while they build the courage to act. We need to pass this on…to voice support for the Jewish people and speak out against injustice. One thing we can know for sure is those who bless the people of Israel will be blessed those who curse them will be cursed (Genesis 12:3). Not only should we take God at His word but it’s also the right thing to do. No people group should be demeaned like this. God will not abandon the Jewish people and neither should we. We know who wins in the end and it sure won’t be those who promoted and acted on hate.